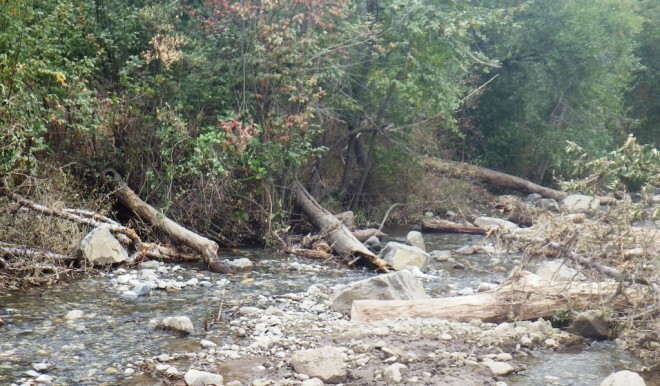 Large woody debris installed to improve fish habitat. 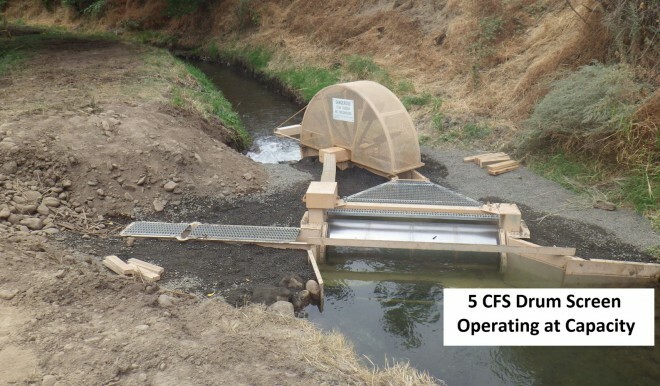 TITUS CREEK DIVERSION FISH PASSAGE & SCREENING: The Titus Creek project is an ambitious and complex project that required a great deal of planning and coordination. Titus Creek is a distributary of Mill Creek originating from a Mill Creek side channel. This side-channel is excellent fish habitat and is used by endangered fish species for spawning and rearing. Prior to the project, a barrier diversion dam diverted water for irrigation from this side channel into Titus. The barrier inadvertently blocked the side channel from migrating fish and directed juveniles into Titus, not the side channel. When irrigation ended for the season, these juveniles were at risk for stranding. 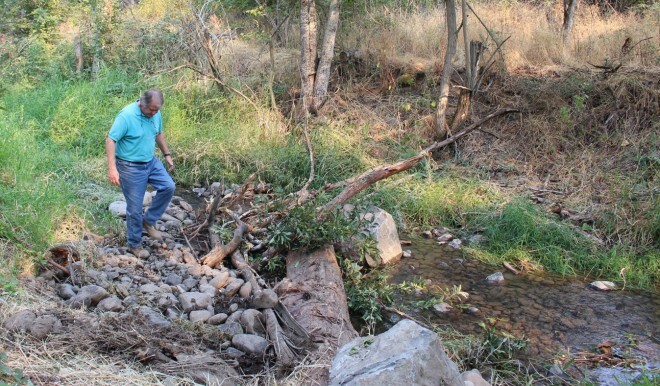 Property owners Kirk Klicker and Ken Harrison (Abeja winery) were very aware of the risks to endangered fish species and greatly appreciated help from the district in designing a solution that protected fish while allowing continued irrigation. 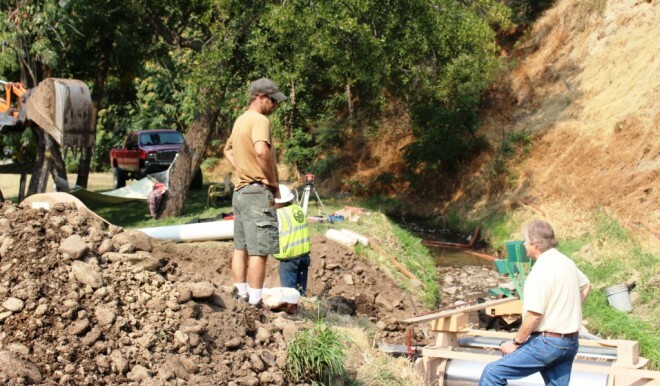 Project manager Greg Kinsinger applied for and received a grant through the local lead entity, the Snake River Salmon Recovery Funding Board, to design and construct the project. WDFW Yakima screen shop designed and built a fish screen to meet National Marine Fisheries specifications. District engineer Lance Horning, in consultation with WDFW and the Recreation Conservation Office, designed a series of rock-sills and a head gate system. The project also includes enhancement of the side channel, with large woody debris installed to provide shelter and pools to enhance fish habitat. 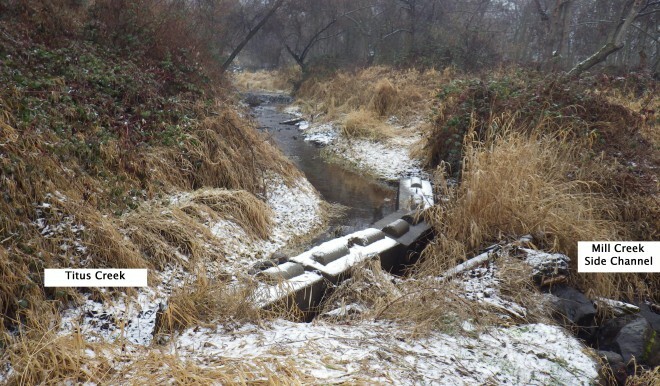 The end result: a screen prevents fish from entering Titus Creek and a step-pool fishway diverts them to the improved habitat on the Mill Creek side channel. 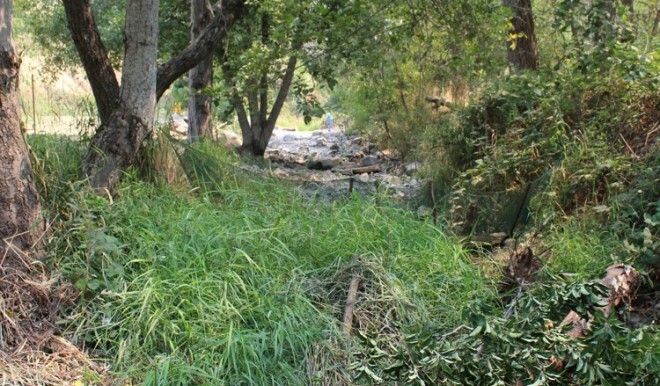 A fish barrier prevents stranding by blocking fish from migrating up from lower Titus Creek. Fish are protected, habitat improved, and farmers can continue to irrigate, demonstrating again that engaging landowners as partners in conservation results in work on the ground to protect endangered species and natural resources. Read the Final Report – Titus for more details.